The building of the Museum of Vietnamese History is a magnificent illustration of Indochinese architecture, which was witnessed until the 1910 French consulate. The building was previously used as the residence of then Governor Generals as well. Over time, the building deteriorated through the years up until the early 1930s when it went through a seven-year long renovation. Today, the magnificently constructed building invites visitors to a striking two-storey rotunda that remains as the entrance to the spectacular exhibit and galleries of the museum. The museum houses is of the country’s most impressive pieces of the French era architecture and is also home to a fine collection of artifacts from the country’s ancient and more recent history. If other Hanoi museums have bombarded you with intense war and propaganda, the Vietnamese History Museum welcomes you with both a pleasant setting and a superb collection. 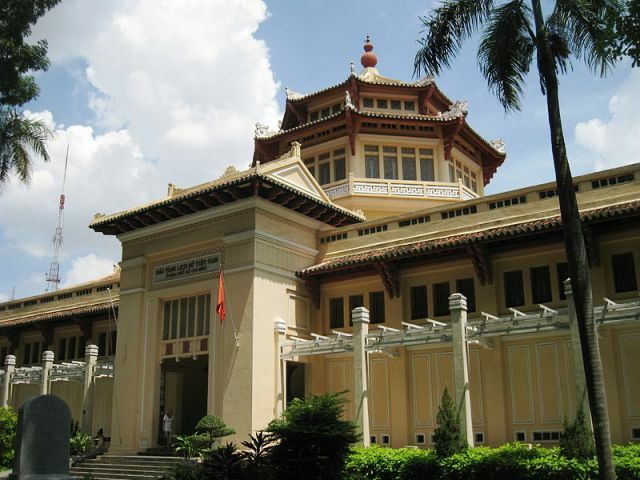 Some of the museum’s highlights include a collection of Dong Son drums, Central Vietnam’s Cham Kingdom artifacts and costumes and items of the country’s last royal dynasty, the Nguyen Dynasty. The Bronze Age of the Dong Son Civilization flourished in the Province of Thanh Hoa for more than a thousand years. During 1200 B.C., their stunning drums depicted life and nature during the time by use of advanced casting techniques making these drums intricately and spectacularly designed. Today, the Dong Son drums are commonly used as contemporary symbols of the culture and civilization of the Vietnamese. Another stunning sight includes a collection of the artifacts during the Cham Kingdom. The Cham Kingdom ruled across the Central and Southern Vietnam until its final territories were halted by the Vietnamese by the start of the 19th Century. The ethnically Malay-Polynesian Cham Kingdom had already created a vast land ultimately rich in culture. A good amount of these artifacts are remarkably used as outside elements in today’s structures. Finally, an amazing collection of pieces from the country’s royal dynasty can be seen with the most extensive of which coming from the Nguyen Dynasty which came to an end in 1945. Here, visitors will be able to notice the lavish work of art these pieces possess long before modern techniques were ever used. Unfortunately, the museum provides limited English language descriptions as well as lack of contextual information, making it a major letdown for English-language tourists interested in the diverse history of Vietnam. Nevertheless, hiring an informative and talkative tourist guide will instantly fix the problem. Guided tours are available upon request of the visitor especially when traveling in groups. The entire exhibit display of the National Museum of Vietnamese History presents a refreshing contemporary feel of Vietnam’s pre-20th Century evolution. The contents of the museum are just as fascinating as the building that houses them so make sure to stop by such a remarkable landmark.